“Whatever you do, in word or deed, do everything in the name of the Lord Jesus, giving thanks to God the Father through him” (Col 3:17 ESV). 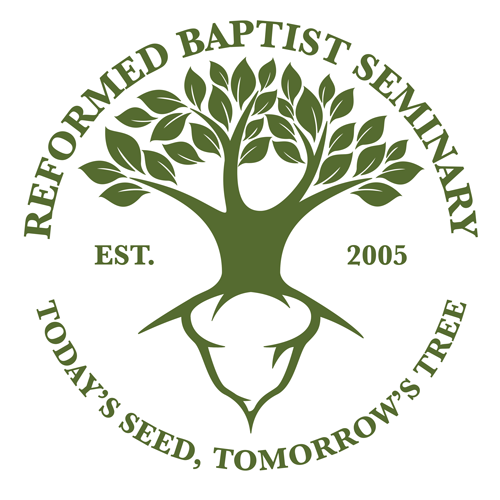 I'd like to take a few moments to reflect on what Christ has enabled Reformed Baptist Seminary to accomplish with a special focus on the past year. We'll look at our increase in student enrollment, graduates, website and virtual campus updates, module offerings, international training, and current financial status. Then I'll highlight some of the seminary’s plans and projects for the future with respect to new course offerings and media development, the Lord willing. Let's begin with a look back over the past year. Over the past several years the seminary has experienced a steady degree of growth. RBS began with nine students. Presently, we have 61 students enrolled. Since the school’s founding, 28 students have graduated from either the Marrow of Theology program (18) or the more comprehensive Divinity program (10). These numbers above do not include the many graduates from our international ministry in Latin America. This summer we updated our seminary website and began upgrading our “Virtual Campus” (VC) to match the look of our new website and to utilize the latest version of Moodle learning management software. The new Virtual Campus is scheduled to open on or before October 31. Students can login to VC with a username and password, navigate to the course they’re taking, download the syllabus, access course lectures in audio and/or video format, and take quizzes and exams online. In some cases the quizzes or exams are graded automatically by the computer. In other cases the instructor receives an email notifying him that a quiz or exam has been completed. He can click on the link in the email, login to VC, and grade the exam manually. Online learning allows the student to remain under the oversight of his elders and to continue serving in his own local church. Moreover, that student can arrange his studies to fit his own schedule. The discipline required to maintain his priorities as he seeks to balance his varied responsibilities with his studies is the kind of preparation he’ll need for the ministry. What’s more, online instruction keeps the cost of a formal theological education manageable. To update and add to our curriculum, as well as to serve students who benefit from live instruction, RBS offers two or three modular courses per year in different regions of the U.S. In 2013 we dealt with ecclesiology from the complementary perspectives of both systematic and practical theology. Our January module entitled “Church Ministry” featured six lecturers who addressed such topics as developing local church vision and ministry philosophy, discerning principles for worship and guidelines for music, implementing strategies for evangelism and discipleship, cultivating community groups, and using technology in various facets of church outreach, discipleship, community, and outreach. In August Greg Nichols delivered thirty lectures on “The Doctrine of the Church” as part of our systematic theology curriculum. These included an expositional survey of all the relevant passages that employ the primary Greek term for “church” (ekklesia) and a systematic collation of the data that highlights the church’s unique identity, institution, mission, etc. Fifteen students and auditors attended the lectures and were richly edified and blessed by the instruction. Both of these 2013 modules were recorded in digital audio and video format. We’ve made the audios available to churches and to the public on our website without charge. This is our way of saying “thank you” to the churches that have prayed for and supported our ministry. We hope the lectures may also serve as a tool for training future leaders for ministry. We partnered with La Iglesia Bautista de la Gracia (Grace Baptist Church) of Santiago, Dominican Republic, to offer a 26 credit program to a group of about 35 to 40 local pastors. After participating in all the lectures, completing the reading, and passing the exams, 23 of those pastors graduated in 2007 with a Certificate of Theological Studies. Especially encouraging is the fact that three of those students continued their studies with RBS and earned the Master of Theological Studies. Moreover, they worked together with Oscar Arocha, the senior pastor, to commence their own residential church-based academy--La Academia Ministerial de la Gracia (AMG; “Grace Ministerial Academy”). RBS carefully reviewed their course offerings and agreed to recognize their own version of the “Marrow of Theology” program. Every year AMG invites a select number of men from various parts of Latin America and the Caribbean to participate in a nine-month intense training program that includes immersion within the life of their own church. Since AMG’s inception in 2008, they have graduated over 70 students, including several from their own congregation. What they learned from us they’re now imparting to faithful men who will be able to teach others also (2 Tim 2:2). In connection with the fall graduation service Pastors Guillermo Gómez and Jorge Castañeda organized a Pastors’ Conference that centered on the five “solas” of the Reformation. Over 200 attended and, as a result, over 50 pastors and aspiring pastors requested that RBS offer another round of the Marrow program in Colombia. Consequently, we began round two of the Marrow in Bogota in the spring of 2011. This year Pastor Salvador Gomez lectured on the biblical covenants (May) and Pastor Guillermo Gomez on Church History (Sept). That leaves just five modules to go. Lord willing, we hope to complete the second round of the Marrow program in Bogotá, Colombia in 2014 or 2015. RBS’s longterm goal is to adequately equip Latin American pastors so that they may eventually become the future trainers of subsequent generations. Our overall income and expense levels appear to be on target. Praise the Lord for his generosity and pray for his ongoing provision in the days ahead. During the week of January 27-31, 2014, Immanuel Baptist Church of Sacramento, CA, will host a module entitled “Calling & Cultivation” (see below) Pastors Jeff Johnson and Robert Briggs will address the subject of a "call to ministry," as well as the cultivation of godliness at the level of a man's personal character, marriage and family, and his public ministry. Dr Michael Haykin will serve as a guest lecturer and speak the final day on the personal piety of 18th century Calvinist Baptists. Join us for a time of rich fellowship, biblical instruction, and Christ-centered exhortation. You can access a module registration form, lecture schedule, and course syllabus from our website (click here). In addition to upgrading our current Virtual Campus, we’re currently engaged in a pilot program with “Pathwright”--an entirely different kind of learning management system that will better help students and teachers track progress and enhance interaction. “Live-streaming” is also an avenue of delivery we are investigating. Each new module we offer means updated audio and/or video. We have already begun to make some of our media available to the public. As God provides the needed funds, we hope to fill out our curriculum with new course offerings, update older courses, and make this media available to churches and pastors worldwide (perhaps in the form of an “app” for tablets and smartphones). Such a tool would not only provide another venue for our students to access our audio and video lectures, but it would also serve as a medium to make our theological training accessible to people all over the world. The possibilities are endless and the prospects are exciting! We want to offer a special thanks to those who have supported the seminary with your prayers and/or finances. As we look toward the future, we’d like to entreat your continued support. If you’ve not been able to support the ministry in the past financially, perhaps you’ll consider supporting us in the future. A one-time gift to help us update our curriculum in digital format and make the lectures available on the Internet and on mobile devices would be appreciated. If you’re not able to support RBS financially, that’s okay. We would, however, appreciate your prayers! Pray that God would bless the lives and ministries of the students and pastors who have received training through Reformed Baptist Seminary. Pray that the Lord would grant the seminary staff, overseers, advisors, and instructors the wisdom and skill necessary to continually improve and refine our courses and programs. Pray that Christ may be pleased to provide RBS with the financial support we need not only to maintain our present ministries, but also to expand and enhance our theological training options.